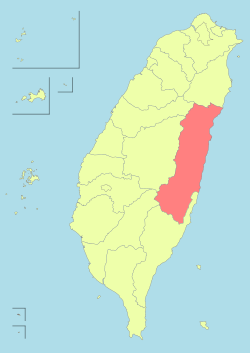 Hualien County (Mandarin Pīnyīn: Huālián Xiàn; Hokkien POJ: Hoa-lian-koān or Hoa-liân-koān; Hakka PFS: Fâ-lièn-yen; Amis: Kalingko) is a county on the east coast of Taiwan. It is the largest county by area, yet due to its mountainous terrain, has one of the lowest populations in the country. The county seat and largest city is Hualien City. Most of the population resides in the Huadong Valley, which runs north to south, sandwiched between the Central and Hai'an mountain ranges. Due to the rural nature of the county, Hualien attracts many visitors for its natural environment, which includes Taroko Gorge, Qingshui Cliff, and Qixingtan Beach. Modern-day Hualien City was originally called Kiray (Chinese: 奇萊; Pe̍h-ōe-jī: Kî-lâi), after the Sakiraya Taiwanese aborigines and their settlement. Spanish settlers arrived in 1622 to pan for gold. Picking up the sounds of native words, these settlers called the area Turumoan (多羅滿; To-lô-boán). Han Chinese settlers arrived in 1851. Qing Dynasty records give the name of the region as Huilan (洄瀾; Hoê-liân; 'eddies') due to the whirling of waters in the delta. During Taiwan's Japanese colonial period (1895-1945) the island's Japanese governors opted not to transliterate the name "Kiray" because the Japanese pronunciation of the word resembled the Japanese word for "dislike, disgusting" (嫌い, kirai). The official name became Karen Harbour (花蓮港, Karenkō). Karenkō Prefecture consisted of modern-day Hualien County. Toward the end of World War II the Governor-General of Taiwan moved many Japanese residents of Taiwan to the area to develop agriculture. After Japan's surrender in 1945, the rule of Taiwan was passed to the Kuomintang government of the Republic of China. Hualien was established as a county named Hualien County of Taiwan Province on 25 December 1945. A few years later, the Kuomintang soon became refugees in Taiwan following the rise of Communism in China (1949) but continued to govern the island according to the Republic of China constitution. In 1951 Hualien was the first county in Taiwan to be governed according to the ROC local autonomy law. In the 1980s and 1990s Taiwan transformed itself into a self-governing multiparty democracy. Today the Hualien area serves as the key population centre on the east coast as well as the one of five main life circle regions in Taiwan，together with Taipei, Taichung, Tainan and Kaohsiung. Hualien County is situated in eastern Taiwan Island. It faces the Pacific Ocean to the east, Central Mountain Range to the west bordering Taichung City, Nantou County and Kaohsiung City, Yilan County to the north and Taitung County to the south. It stretches around 137.5 km (85.4 mi) from north to south with its width ranging from 27 to 43 km (17 to 27 mi) long from east to west. Its area is about 4,628.57 km2 (1,787.10 sq mi) and occupies one eighth of Taiwan's total area. Despite its vast area, only 7% of the county area is populated. The remaining area is occupied by rivers (7%) and mountains (87%). Mountains are composed of Central Mountain Range in the west and Haian Range in the east. The main rivers in the county are the Hualian River, Xiuguluan River and their branches. The plains stretch along the valleys between both mountain ranges with a width around 3–6 km (1.9–3.7 mi). Due to the restriction of its landscape, Hualien people reside mostly on the alluvial fans of the Huatung Valley plains. Hualien City, the county seat of Hualien County. Hualien County is divided into 1 city, 2 urban townships, 7 rural townships and 3 mountain indigenous townships. Some towns have Japanese names because these towns were named by Japanese during the Japanese ruling period from 1895 to 1945. Hualien City is the county seat and houses the Hualien County Government and Hualien County Council. Hsu Chen-wei, the incumbent Magistrate of Hualien County. Hualien County voted one Democratic Progressive Party legislator to be in the Legislative Yuan during the 2016 Republic of China legislative election. 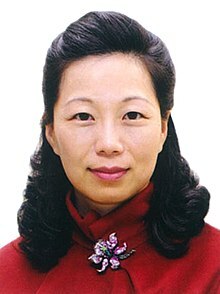 The incumbent Magistrate of the county is Hsu Chen-wei of the Kuomintang. Population density around the county (December 2009). Hualien County has 333,392 inhabitants as of December 2014 and is divided into 1 city and 12 townships. Its late development means that many aboriginal cultures such as Amis, Atayal, Bunun, Truku, Sakizaya and Kavalan are well-preserved. As of 2014, aborigines make up 27.5% of the population of Hualien County (about 91,675). The Hakka people comprise about 30% of inhabitants. The county has seen a negative population growth over the past few years due to emigration to other places outside Hualien County with an average reduction of 1,393 people per year over the past 18 years. According to a 2015 survey on national happiness index, Hualien County was rated as the happiest place to live in Taiwan among other 20 counties and cities due to the residents happiness driven by strong levels of satisfaction with work-life balance, living condition, education, environmental quality and the performance of the local government. The internationally famous Buddhist Tzu Chi foundation is headquartered in Hualien City. There are also many temples around the county. Buddhism and Folk religions are popular in Hualien County. 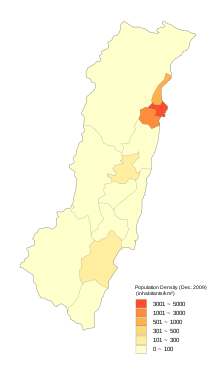 Hualien County also has the highest concentration of Roman Catholics in Taiwan at 9.46% of the population. Hualien County is home to the Hualien Stadium and Hualien Baseball Stadium. Because of its awesome scenic view, fresh air, fine weather, and plenty of well-maintained bike trails, Hualien County is a popular destination for cyclist enthusiasts and marathon runners. Many cycling tournaments and marathon events are held each year in Hualien County. For example, Taiwan KOM Challenge and Taroko Gorge Marathon. Cement plant in Xincheng Township. There is cement mining activity in the county. The Asia Cement Corporation plant in Xincheng Township contributes nearly 29% of Taiwan's annual cement production. The Hualien County Department of Education lists in all 6 institutions of higher learning within the county's borders as well as 15 high schools, 35 junior high schools and 151 elementary schools, though some of the listed elementary campuses have been closed for years due to their remote location or to low enrollments. Hualien County is home to National Dong Hwa University, Tzu Chi University, Taiwan Hospitality and Tourism University, Tzu Chi University of Science and Technology and Dahan Institute of Technology. Hualien County houses the hydroelectric Bihai Power Plant with an installed capacity of 61.2 MW and coal-fired Hoping Power Plant with a capacity of 1,320 MW, the fourth largest coal-fired power plant in Taiwan. Both power plants are located in Xiulin Township. Due to the power plant, Hoping is also the location of a deep water bulk cargo port. Hoping port is located in Hoping Village, Xiulin Township. National parks in the county are Matai'an Wetland Ecological Park, Taroko National Park and Yushan National Park. The county is also home to several mountains and cliffs, such as Hehuan Mountain, Pingfeng Mountain, Qilai Mountain and Qingshui Cliff. Other natural areas include the Liyu Lake, Shihtiping, Mugua River Gorge, Walami Trail, Niushan Huting, East Rift Valley, Rareseed Ranch, Lintianshan Forestry Culture Park and Chihsingtan Beach. Museums and historical buildings in Hualien County include Pine Garden, Saoba Stone Pillars, Hualien Cultural and Creative Industries Park, Chihsing Tan Katsuo Museum and Hualien County Stone Sculptural Museum. Farglory Ocean Park is in Hualien County. Hualien Martyrs' Shrine, Eternal Spring Shrine and Xiangde Temple are located in the county. Night markets in the county are Dongdamen Night Market. ^ a b "Aborigines now make up 28% of Hualien County". ^ 撒奇萊雅族_認識本族. TAIWAN INDIGENOUS PEOPLES CULTURE PARK. Archived from the original on 11 May 2015. Retrieved 3 December 2014. ^ "INTERVIEW: Hualien commissioner Fu targets debt". ^ "2016 The 14th Presidential and Vice Presidential Election and The 9th Legislator Election". ^ "Amis remains Taiwan's biggest aboriginal tribe at 37.1% of total". ^ Cheney, David M. "Mr". Catholic Hierarchy. Retrieved 11 July 2016. ^ "2015 Taiwan KOM Challenge". ^ "Taroko Gorge Marathon 2016". Event Carnival. ^ Kuo, Chia-erh (13 June 2017). "Asia Cement denies mine site in Hualien expanded". Taipei Times. Retrieved 15 June 2017. Wikimedia Commons has media related to Hualien County.